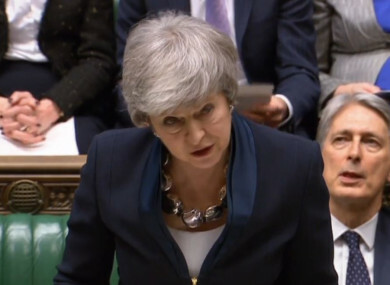 UK PRIME MINISTER Theresa May has said that the House of Commons will hold a series of meaningful votes in the next few weeks to decide what form Brexit will take, including a potential vote on whether to delay Brexit. It comes as her talks with the EU have so far failed to reach any breakthrough on the Irish backstop, which is vehemently opposed by members within her own party and the DUP. She told the house today that, on or before Tuesday 12 March, a meaningful vote will be held on her withdrawal agreement with the EU. If parliament votes in favour of that, the UK will leave the EU with the deal in place. If that withdrawal agreement is voted down, there will be another vote on Wednesday 13 March. This time, MPs will be asked whether or not they want to leave the EU without a deal. If the House of Commons votes against a no-deal Brexit, however, there will be yet another vote held. On Thursday 14 March, she said the government will table an amendment to seek a “short, limited extension to Article 50″. Extending Article 50 would mean that the UK does not leave the EU on 29 March, as it is currently set to do. It has been reported that this would only be extended to late June/July. She also said that her government would today publish a paper assessing the UK’s readiness for a no-deal Brexit. “I believe if we have to we’d ultimately make a success of a no deal,” she said, to derision from the opposition benches. May added her preference is for her withdrawal agreement to pass through the House of Commons in the first vote on or before Tuesday 12 March. The Prime Minister also took aim at Labour leader Jeremy Corbyn, who yesterday signalled his backing for a second referendum. Corbyn shot back that May’s further delay to a meaningful vote on Brexit was “grotesquely reckless” and was a “deliberate running down of the clock”. Corbyn added that if May’s deal in the first meaningful vote is approved, then it should be put to a “confirmatory” public vote. Meanwhile, Labour party leader Brendan Howlin told reporters today that after meeting his UK counterpart in the UK Jeremy Corbyn over the weekend, he is pleased that Corbyn is now backing a new public vote on the Brexit deal. He said the withdrawal agreement on the table is the best deal – but added that if there is “a real prospect” that the UK might not leave the EU after a second referendum, then the Irish government should “not be so wedded” to the idea of the withdrawal agreement “that they lose sight” of what a second referendum might achieve. Howlin said the push for a second referendum is it will give the British public a chance to be presented with the final deal that has been negotiated and the choice to remain in the EU. “There is no such thing as a good Brexit,” he said. Email “May says MPs WILL get to vote to extend Article 50 (but a few things have to happen first)”. Feedback on “May says MPs WILL get to vote to extend Article 50 (but a few things have to happen first)”.